1 - Pick up the mixer and water-tight seal. Place the water-tight seal over the two hoses. 2 - Position the water-tight so that it sits securely on the base of the tap and hold it there. 3 - Pass the hoses through the hole in the sink for the mixer. 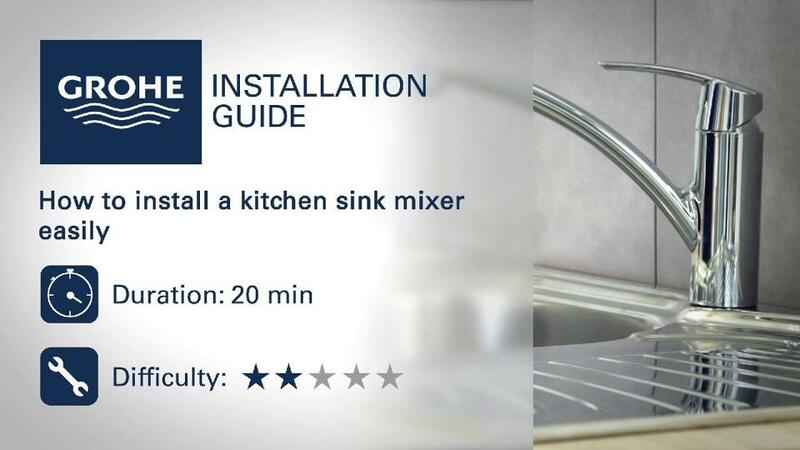 4 - Place the mixer so that the water-tight seal is in contact with the sink, . Hold the mixer in this position. 5 - Hint: use the hoses to hold the mixer firmly until it is attached. 6 - Place the stabilization ring over the hoses, and then along the threaded rod. Similarly, place the tightening seal and then, lastly, place the tightening nut. Hand-tighten the nut to the maximum. 7 - Release the mixer, which is now held in place, and visually check its proper orientation. Adjust it if necessary. 8 - Hold the mixer and use a 13 mm open-end wrench to tighten the nut without forcing. 1 - Make sure that the seal is present in the hoses. If necessary, add a fiber or rubber seal. Screw the left-hand hose onto the hot water faucet, and the right-hand hose on the cold water faucet. Tighten with a 19 mm open-end wrench. Make sure there are no kinks or bends in the hoses. 2 - Open the two water lines and make sure the faucets do not leak. 3 - Make sure the mixer is operating properly.